Pápai Páriz Ferenc, Album amicorum p. 462. Londini d. 1. Octobr. 1717. * 1Thess 5:21: in the Vulgate: “omnia autem probate quod bonum est tenete”. Also quoted by Campegius Vitringa, Jr. on p. 125. In London, on October 1, 1717. Krystian Sitkowski (Sitkowius) was a member of the Protestant community in Poland. In 1706 he studied in Frankfurt an der Oder, and in 1707-1708 in the Netherlands. He became pastor of the Reformed church of Leszno (Lissa). This town accepted several waves of Protestant refugees from the 16th century on, the Czech Brothers had both a church and a school here. In the latter taught from 1628 Jan Amos Komenský (Comenius), and here was rector and town pastor the grandson of Comenius Daniel Ernst Jablonski, the later court preacher of the Prussian king in Berlin. Lissa burnt down in the Northern War in 1707, and at this time Jablonski made much effort for the rebuilding of the school and the church. Sitkowsi and his companion Samuel Andersch were advised and supported by Jablonski to travel to the Netherlands and to England between 1715 and 1717 for collecting donations. On November 22, 1734 Sitkowski was elected superior of the Czech Brothers in Poland, and in 1735 he participated at the consacration of the Bishop of the community of Herrnhut. He died in Geneva. A part of his heredity, thus his documents referring to his fundraising tour, are preserved today in the Unitätsarchiv der Evangelischen Brüder-Unität in Herrnhut. He wrote a number of ecclesiastical works, thus among others the history of the Reformed communities and schools of the Polish Kingdom and the Lithuanian Grand Duchy: Notitia ecclesiarum ac scholarum evangelico reformatorum per Regnum Poloniae et M. Ducatum Lithuaniae dispersarum. In: Tempe Helvetica: Dissertationes atque observationes theologicas, philologicas … Zürich, 1735-1742/43. Index in 6. 1742/43. From a letter written by Pápai Páriz to Count Sándor Teleki on December 25 (14), 1715 we know that the Polish had arrived six weeks earlier to England with letters of recommendation from the Prussian king. This royal support was most probably secured by Jablonski. Although Pápai Páriz notes that they feared the new fundraising competitors, nevertheless Sitkowski calls him his "supporter" (fautori suo optimo) in his note written in the Album on October 1, 1717. Both the date of the earlier letter, and the text of the present note confirms that for two years they had been making common efforts in the interest of the support of their respective churches (per biennium pro ecclesiarum patriarum bono secum desudanti). 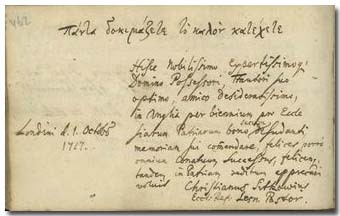 Samuel Andersch, companion of Sitkowski had written in the album in May of 1716 in London, while Jablonski at the beginning of the peregrination of Pápai Páriz, in November of 1711 in Berlin (pp. 463, 121).